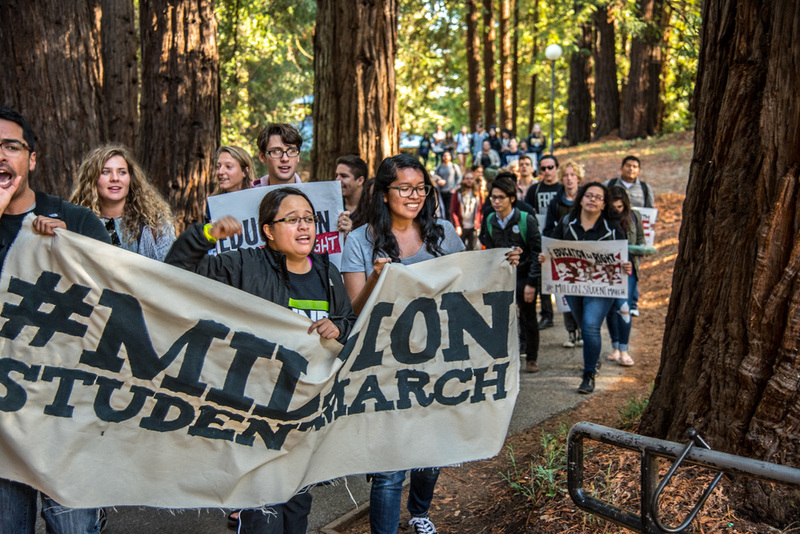 Students at UC Santa Cruz in California joined students at college campuses across the country for a "Million Student March. The latest wave in a rising consensus seeking free college tuition and other debt-free education demands crashed across the United States with the Million Student March. On November 12, hundreds of thousands of students from colleges and universities nationwide walked out of their classrooms and onto the streets demanding tuition-free college education, cancellation of student debt, and a $15 minimum wage for campus employees. “The United States is the richest country in the world, yet students have to take on crippling debt in order to get a college education,”the marchers state on their web- site. With a roster of supporters that includes Noam Chomsky, Thomas Hartman and Jill Stein, and organizations as varied as National Nurses United and the Energy Action Coalition—as well as many Bernie Sanders campus support groups—the marchers made good on the adage of strength in numbers. Inspired, the two set up a Facebook page and a website, encouraging a wide coalition of students to participate in the protest day on their own campuses, and were overwhelmed by the response—so much so that they had to create an organizing committee to parse out their demands and plan the march logistics. ​“Education is a right, not just for the rich and white,” demonstrators chanted at Hunter College in New York City, Newsweek reported. As the marchers note on their site, the average college student in 2015 graduates with $35,000 in debt. It’s estimated that roughly 70 percent of students borrow to pay for college, with no end in sight to soaring costs.